Six String Sonics, The is about reinventing the guitar. Gil Kuno destroys the guitar! Feeling that 1 player on 6 strings hindered what was possible in composition, he created a way for 6 players to simultaneously play 1-stringed guitars. Part sculpture, part dance, part dare-devil, and ALL inspiration. Artist Gil Kuno created "Six String Sonics, The" to rid the guitar of its ergonomic limitations and make room for more possibilities in composition. Instead of stringing 1 guitar with six strings, Gil created 6 single string guitars to be played collaboratively by 6 guitarists at the same time. The resulting compositions sound much more colorful than standard guitar music, as the group is capable of reaching many more chords and melodies. Stringed instruments have a history of over 5000 years, and the modern day six-string guitar has a 250 year history. Despite the fact that society has latched on to this design for so long, its design is flawed, as it binds the player to chords and melodies that he/she can easily reach with one hand - a hindrance to creativity. Conventional six-string guitars organize chords according to ergonomic efficiency, thereby hindering the exploration of other string combinations. We created Six String Sonics, The to rid the guitar of these limitations, and make room for more possibilities in composition. Instead of stringing one guitar with six strings, we have created six single string guitars to be played collaboratively by six individuals at the same time. The resulting compositions sound much more colorful than standard guitar music, as the group is capable of reaching many more chords and melodies. Additionally, the dynamics of the collaboration allows for new possibilities in compositional arrangement. With Six String Sonics, The we hope we can expand the six-string guitar's compositional vocabulary. Presenting a re-imagination of the physical structure and performative abilities of string instruments—more precisely, the guitar—the multi-faceted work includes a 20-foot sculptural instrument that’s played by six musicians, live performance and projected visuals. Kuno’s goal was to break away from the conventional way we think about the instrument, which he found “dangerously constraining” with its 6-string format and limiting design (why are there six strings if we only have five fingers? why do some chord progressions give guitarists tendonitis?). 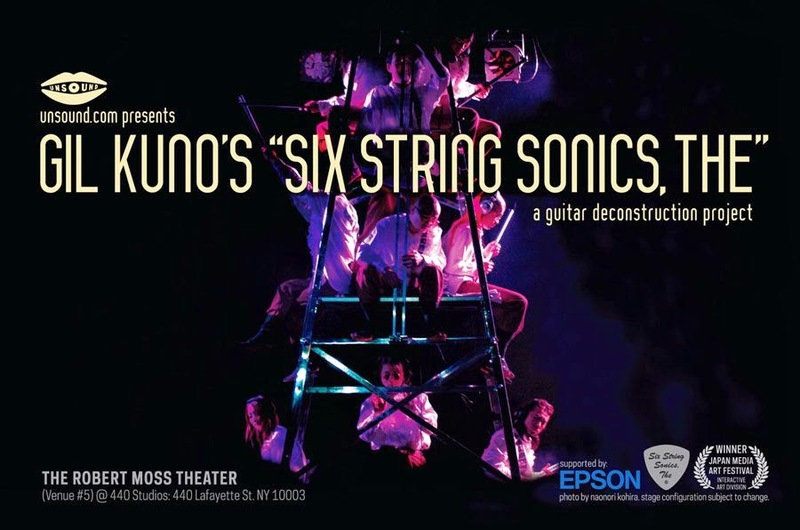 Kuno divided the six strings, making six guitars with one string each, capable of being played simultaneously in all manner of chord progressions by six individual guitarists who sit perched on the scaffolding-like structure. “I am not aiming to build a better guitar, but to change people’s perspective,” explains Kuno, who is himself a musician. 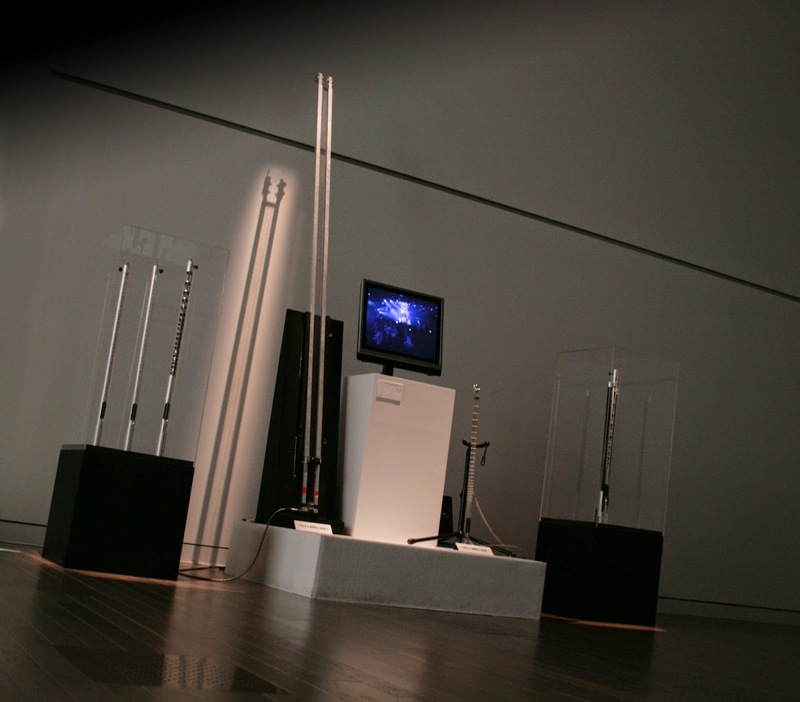 The project encompasses musical performances, often paired with interpretive dance and audio-responsive visual projections. He also released an EP under this performance model called String Theory. The single string guitars and Bass Giant were milled out of metal - mostly aluminum with some steel and carbon. Metal neck guitars (Travis Bean, Magnum, Veleno) were studied to come up with the ideal design. The guitars were fitted with single coil pickups and strung with high-quality steel guitar strings. A "Six String Sonics, The" performance is a spectacle in itself. In the first performances in Tokyo, the guitarists sat on a five-meter (twenty-foot) structure to play their instruments. This made room for additional entertainment pieces on stage while foregrounding the musicians as the centerpiece. The front of the ladder housed several musicians. A percussionist triggered drum samples at the bottom of the ladder. Two bassists played a 2.5-meter (ten-foot) bass situated at the top of the structure. The longer bass strings give the instrument a much deeper tone than that of a conventional bass. Reactive Bodies, The are a dance troupe that articulates their movements to the sounds of each instrument. Their syncopations to Six String Sonics, The's music result in a unique audio-visual synergy. Reactive graphics are displayed behind the band to help visualize the sounds generated by each musician. Reactive graphics in NYC by Jonathan Bobrow + Gil Kuno. Through careful social conditioning, the mind is guided to think within certain patterns. Gil tries to redirect the flow of the mind outside of the set patterns we are taught by society to construct. In his work, he attempts to displace natural activity from its context, revealing an otherwise hidden level of metaphorical absurdity within the ordinary patterns present before our eyes. The goal of sublimating everyday perception underlies many of the projects he has exhibited or performed. He aims to push people away from paradigmatic thinking through various themes and methodologies – aleatoric systems (chance operations,) exaggerated perception, derailed reality and re-envisioning experiences common within everyday life. Gil received his MFA at UCLA. He has achieved recognition from Ars Electronica, Japan Media Arts Festival, Canon Digital Creators Contest, Timothy Leary (Leary.com), among others.